Posted by Tantumblogo in asshatery, disaster, error, foolishness, Francis, General Catholic, horror, paganism, Revolution, scandals, secularism, self-serving, sexual depravity, Society, the struggle for the Church, unbelievable BS. It is amazing the degree to which the program of Francis, Bishop of Rome, follows that of the modernist/progressive elements of Vatican II. Relative to the statements in the documents themselves, Vatican II unleashed a torrent of changes and chaos all out of proportion to the (I freely admit, and furthermore, passionately argue) rather limited errors that were promulgated therein. There is not much in Vatican II that can be taken to directly attack belief in the Real Presence, and yet the changes implemented since Vatican II have constituted a full-on assault on that precious belief and have left only a small minority of “Catholics” believing in this Dogma so absolutely central to the Faith. Heck, it is THE central Dogma. The revolution was worked, primarily, with small changes. A shift of emphasis here, a dubious pronouncement there, a wink, a nod, and all of a sudden, we had an entirely new religion. Please understand, I am not under-emphasizing the importance or the scale of the errors present in most all the documents of Vatican II at all. I am simply saying, relative to their effects (ginormous), those changes themselves were relatively small. And we see the same thing at work in the wake of the disastrous 2014/5 synods and the post-synodal exhortation Amoris Laetitia. Amoris Laetitia is a disastrous document for numerous reasons, it does gravely undermine the sanctity of marriage and the Eucharist to an amazing degree, but most all the well-placed concern over the document has come more from the, by now, all too predictable consequences of what would flow from it. By leaving the door open to Communion for those persisting in adulterous relationships with a still valid marriage under what were purported to be supposed “special circumstances,” following a “process of discernment and penance,” is now rapidly becoming a de facto acceptance of divorce in the Church and the provision of the Eucharist for those who manifestly and constantly commit adultery in a relationship outside their still-valid marriage. Stephan Burger, the Archbishop of Freiburg, expects a document of the German Bishops concerning marriage and the family and concerning the Church’s dealing with the remarried divorcees. The Bishops’ Conference has seen it as its task to pick up on Pope Francis’ recent explanations and to make them more concrete, said Burger to the Diocesan newspaper Konradsblatt in Karlsruhe. They will leave nothing left. Look, I use the term “different religion” as a kind of catch-all for the modernist/leftist influences in the Church, and there are certainly many arguments, some quite persuasive, that the Novus Ordo establishment-types have constituted a new and different religion since Vatican II, but this here……..this is making the tattered fig leaf of unity whither to nothingness. If Communion becomes a free-for-all, then it means nothing – read my previous post from St. Justin Martyr, on adherence to Doctrine, practice, and eschewing of all sin that contradicts same, as being a prerequisite for reception of Holy Communion. And that was written almost 1900 years ago! I’ve always been very reticent to draw the most obvious conclusions from the experience of the Church in the past 50+ years since the Council, because the implications of such considerations are soul-crushing. Under Benedict (boy, was I fooled – well, kinda), that fig leaf of unity seemed to have a little bit of realism to it, we, or I, could fool ourselves that the worst was over and things would improve, at least after a fashion, and maybe many years down the line. That is obviously not the case. Apparently, these guys are absolutely determined to force the issue. You will either submit to the new religion and all that implies, or…….you can go through many months or years of agonizing existential angst, at the least, that’s for sure. I don’t let myself think about this stuff much because the answers are all very bleak and none too comforting. But, like I said, they appear absolutely determined to make those who take this “stuff” – this religion, this Faith – seriously think about constantly. I’d probably be better off if I just totally unplugged. Yellowknife, here I come! Posted by Tantumblogo in awesomeness, Basics, catachesis, Ecumenism, Eucharist, General Catholic, Glory, Grace, history, martyrdom, Saints, sanctity, Tradition, true leadership, Victory, Virtue. 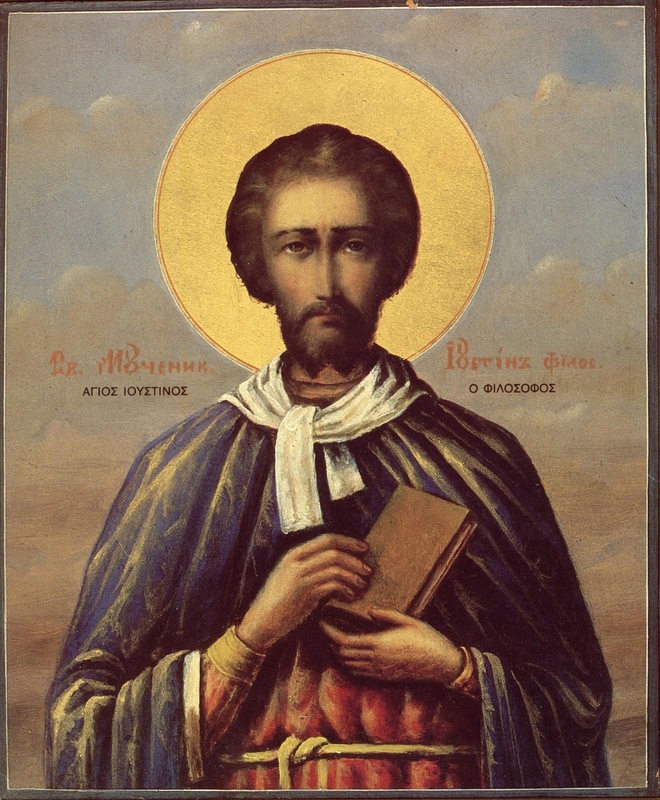 Saint Justin Martyr was a cultured man of letters and one of the first great post-apostolic apologists for the Faith. He carried on a unique and extensive correspondence with the 15th Emperor of Rome, Titus Fulvus Aelius Hadrianus Antoninus Augustus Pius, commonly known as Antoninus Pius, who reigned from AD 138-161. 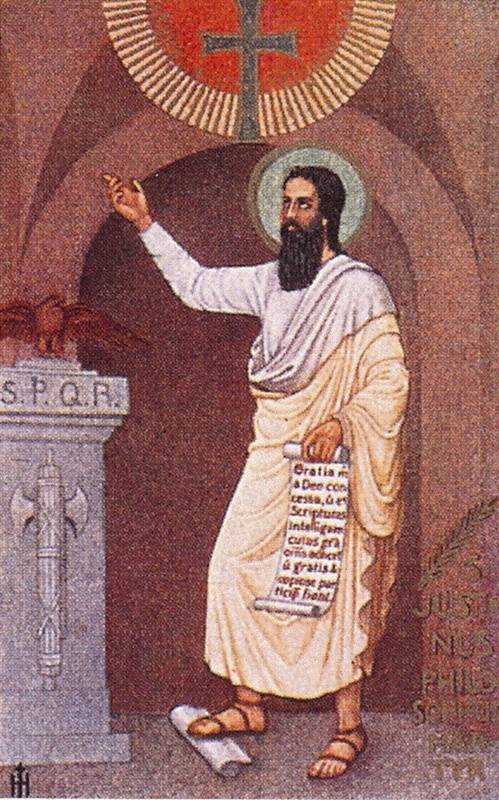 This correspondence is well known among those with more than a very limited knowledge of early Church history, and is one of numerous testimonies from the earliest Church Fathers that prove, without equivocation or the slightest doubt, that the Faith of the Catholic Church of Rome is the exact Faith that was practiced by the earliest Church. This is confirmed in numerous doctrinal beliefs, but one of the most important, and, concomitantly, easiest to confirm, is the total belief in the Real Presence of Our Blessed Lord Jesus Christ in the Most Blessed Sacrament of the Altar held by the early Church. This is confirmed by numerous writings dating to the earliest part of the 2nd century (over 200 years before Constantine supposedly “corrupted the Church,” according to protestants) from St. Ignatius of Antioch and others on (adding to several FIRST century references a la Pope Saint Clement’s Epistles to Corinth, among others) to the best of the 2nd century, Justin Martyr. 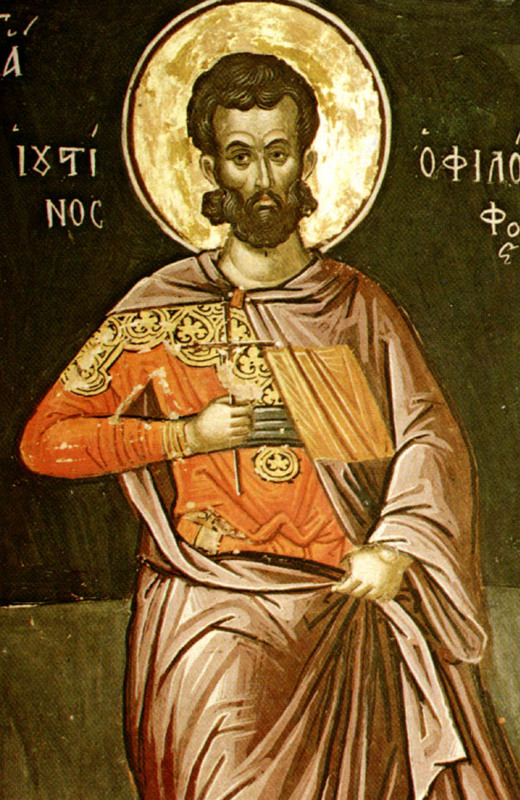 You have to understand the context in which Saint Justin Martyr was writing. Christianity was still almost entirely a secret religion due to persecution. The Mass was not open to the public. As part of the persecution, and partly due to human nature when encountering anything new and different, wild, calumniating rumors flew regarding what went on during the Mass, which was known to feature a Sacrifice. Many of these wild rumors and innuendo’s were started by the earliest Church’s first enemies, the Jews. Jews claimed that Christians sacrificed babies and ate their bodies during the Mass, mixing up scattered bits of the Nativity and Easter narratives, or just being plain malicious. These rumors added further fuel to the already extant persecutions, making them much more severe. Wherefore having explained the sacred ceremonies of baptism, he proceeds to speak of the Eucharist in the following terms: “He that presides in the assembly is presented with bread and a chalice of wine, mixed with water; whereupon, in the name of the Son and the Holy Ghost, he renders glory to the Father. And by these gifts doth he make thanksgiving, which all the faithful confirm by the word ‘Amen.’ The prayers, praises, and thanksgivings being terminated, the deacons take of the bread and the wine, mixed with water, over which all these holy prayers have been recited, and having distributed them among those present, they carry some to the absent also. Thus we see that the present doctrine of the Catholic Church is that which was believed and practiced in the apostolic times, in which our Saint flourished. Unfortunately, Saint Justin failed to convince the obstinate infidel “Pius.” He also got his head lopped off for his trouble. There you go. You get a double-dose of catechesis today. Perhaps this bit of knowledge might come in handy when dealing with protestant family and/or friends. Posted by Tantumblogo in awesomeness, Basics, demographics, family, General Catholic, Immigration, manhood, Revolution, sickness, Society, true leadership. That is very solid advice. It’s well past time I started following it. I also believe strongly in passive defensive measures. Active defense is the gun or whatever means you have to actually go out and “touch” the threat away from your person. Passive means something that provides defense even if the threat reaches your person. So many folks spend tons and tons of money on firearms, ammo, training, and much else besides, but overlook the advantages of a very robust passive defense. I have temporarily settled on a used Air Warrior (mine substantially different from the link, with many more attach points) Level IIIA jacket with additions to add coverage for the shoulders, groin, and thighs as needed though generally I wouldn’t incorporate those absent a very specific threat. This is all soft armor, and about as good as can be found. Eventually I hope to move to hard plate Level IV armor. I friend graciously offered me a plate carrier (which I gladly accepted), but no plates. Unfortunately soft armor like I have is limited to protecting against most handguns or long range small caliber rifle threats, and is also useless against knives/swords. But I got a heckuva deal on it at my Catholic neighbor’s Army Navy store. This is the world the elites are making for us. Some might think always carrying or having body armor handy is over the top, but I doubt many of the hundreds of people in the situations shown in that “Reality Check” video series would agree. h/t reader D, who had a similarly pithy description of the video: “helping muslims adapt to Western culture.” Good one my man. And we plan on taking you up on your offer for Jan 1. Sorry I haven’t replied directly yet.